Developed to mimic human skin. It has patented nano-touch technology for increased micro-stimulation to the epidermis and layers beneath. The elastic, latex-free tape takes very little time to apply, is long-lasting (stays on 3-5 days), is easy to remove and is suitable for patients of every age and condition. 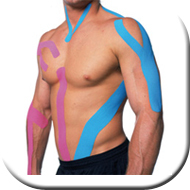 Kinesio Taping is extremely versatile in its ability to re-educate the neuromuscular system, reduce pain, enhance performance, prevent injury and promote lymphatic flow and healing. Uses less glue via new (patented) "fingerprint" technology (see new pattern.) However it sticks even better. More effective hold and improved breathability. It is lighter than the old Kinesio Tex Gold and has a better skin feel.